Kevin was born in Birmingham Warwickshire in 1953 with an English and Welsh background. From an early age he had a love of drawing family portraits, steam locomotives and Daleks. He has many interests including Railways, Music, Nostalgia, Science Fiction, Art, Architecture, Astronomy, Sport, the Natural World and more. After he left secondary school and college with a few “0” levels he wanted to go to Sutton Coldfield Art College and pursue an art career. But his parents wanted him to find a proper, routine 9-5pm job and bring some income into the Parrish family home. In 1971 he found a full time job as a Trainee Draughtsman in civil/structural engineering at a Consulting Engineers company in Sutton Coldfield, Warwickshire. He soon undertook a Day release Building course at the local College which ran concurrently with his employment. Once his apprenticeship was complete with accompanying qualifications his career in Civil Engineering was assured. In 1995 after a successful career in UK and overseas as a Contract Technical Engineer he was finally made redundant from a Consulting Engineers in Birmingham, the place where his career had all started in 1971. At this point Kevin decided to change his career and pursue his first love, which was Fine Art. A decision he has never regretted. Undertaking an Art course at Mid Warwickshire Leamington College in 1995 helped him realise the potential of what he could do creatively. He soon became inspired to convert some of his interests into ideas for creativity onto the Canvas. His preference was to use the oil medium as it suited his way of freehand painting best. In the first instance Kevin wanted to become a Railway Artist and was accepted by the Guild of Railway Artists in 1993 based in Warwick. As an Associate member he exhibited with the Guild around the country. He was invited to attend Steam Preservation events (eg. the Great Central Railway) as a stall holder promoting his Railway Art and he managed to secure a few commissions by meeting steam railway enthusiasts. His Railway Art can be found in Books, Magazines, on Jigsaw Puzzles, Prints; Greeting cards, Postcards etc. Kevin was elected a Full member by the Guild of Railway Artists on the 30 September 2018 by the Guild Council at Kidderminster Railway Museum, Kidderminster Railway Station on the Severn Valley Railway. 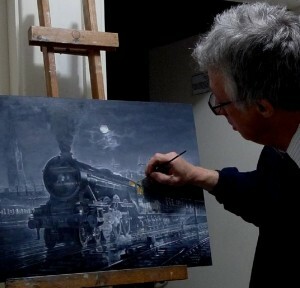 He regards it as an honour to be a Full member and it gives him more credibility as a Railway Artist. From as far back as 1970 Kevin was listening to the symphonic rock sound of Moody Blues music and loved their music and later became inspired as an Artist by their lyrics of love, peace and harmony. He created several montage images of the Band in the late 1990s along with Yes and Cliff Richard and these were published in magazines, CDs and their fanzines in UK and USA and found recognition globally with his fan art. As a child in 1963, at the impressionable age of 10 Kevin started to watch what went on to become a TV phenomenon and legend in science fiction and fantasy’ namely Dr Who . It was compelling, engaging viewing for children as the stories were well written and had strong characterisation. Some of the episodes to him were quite frightening to watch. But they had a healthy sort of fear to them and sometimes he was “behind the sofa”. Not literally. Kevin created several montages of the TV show in the late 1990s and still does to this day as the show is ever evolving and works on so many levels. This ignites his inspiration. His artwork is known in the Doctor Who world through fandom, conventions, charity events and merchandise etc. In 2000 his artwork was promoted by Acanthus Gallery in Balsall Common where he learned some techniques in Fine Art and undertook some Projects and commissions in various genre. From 2001 Kevin was invited to become the Resident Artist at the Jane Powell Art Studio in Kenilworth, Warwickshire. Here he gained a growing interest in the canal network around the Midlands and their history with the rail network. He went on to create many canal/railway scenes with the help from his own photos and his artwork became known in the Inland Waterways world, appearing on their greeting cards along with other greeting card and jigsaw publishers etc.. In 2002 he was promoted as a Fine Artist by Warwick Studios Gallery based in Leamington Spa. Here he had two sell out exhibitions in 2005 and 2008 of monochrome nostalgic traditional artwork. In the meantime from 2006-2008 he was invited to be a Resident Live Artist in the Gallery, undertaking meeting the public, framing paintings for customers, generally helping out running the Gallery and of course painting on the canvas in the Gallery when time permitted. In 2009 Kevin joined the Mitchell Gallery in Warwick. Here he continued creating monochrome oil paintings in a similar style to what was achieved with Warwick Studios Gallery. However his paintings of buildings in Warwick at night with the glow of the moon and emphasis on reflections from wet surfaces, were a development made by Kevin and the Gallery. Kevin was now working from his studio at home. Kevin continued to exhibit his art with the Mitchell Gallery along with other Artists there until its closure in March 2018. The Gallery kindly devoted part of its space to permanently exhibit his artwork known as “the Warwick Collection”. In 2010 Kevin joined a local Rambling Club and became inspired to create scenes from the natural world after experiencing so much joy and pleasure as a Rambler. In 2011 he was accepted and joined the Leamington Lawn Tennis and Squash Club. The first ever lawn tennis club in this country and the world and was founded in Leamington Spa in 1872, six years prior to Wimbledon being founded. Here he was inspired to create portraits of British Wimbledon champions Andy Murray and Ann Jones. These images have been exhibited in their Club House. Kevin has donated his artwork to various Charities over the years, including Science fiction conventions, Police Charities and the Moody Blues fan Club in Surrey and in the USA. In 2018 Kevin became a sponsored visual Artist supporting “The Foresters’ Fund For Children” by advertising his artwork in the charity’s handbook. He has won awards and prizes over the years as a Fine artist pursuing his passion. His name appears in the 37th Dictionary of International Biography published in June 2013. His artwork can be found in private art collections in UK and overseas.